Half-tracks were a big part of the Heer's strategy for a more mobile army and the Sd.Kfz. 7 fulfilled an enormous number of roles. At the outset it was intended primarily as an artillery tractor to haul field artillery. As Allied air power increased, the 7/1 version was upgraded with a quad 20mm anti-aircraft gun and an armored driver's compartment. These quad guns consumed ammunition so quickly that a separate ammunition trailer was often needed. 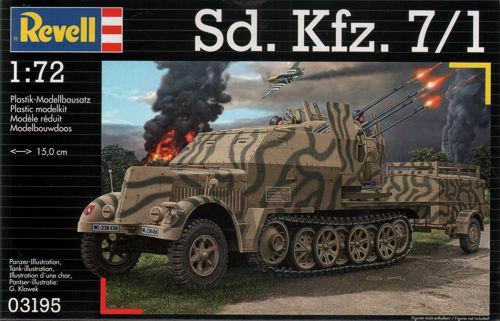 This kit features a detailed Sd.Kfz. 7/1 with munitions trailer and decals for four units.